Microsoft Outlook does not automatically include the official Harvard holiday calendar. This document includes instructions on how to add them using Outlook 2016. Open Outlook and login to your account. From the File menu, select Open & Export. Select Import/Export... to open the Import and Export Wizard. Select Import an iCalendar (.ics) or vCalendar file (.vcs) and click Next. 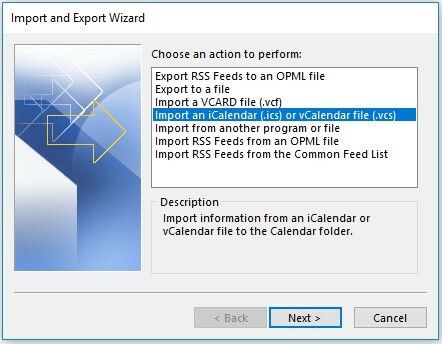 Locate and select the iCalendar file that contains the data you wish to import into Outlook and click OK.
At this stage you will be presented with the options to import the data into your current calendar or to create a new calendar where this data will be exported. If this file contains historical data that has been archived, we recommend adding the data into a new calendar folder by clicking the Open as New button. If you click on the Import button, the file will be imported directly into your current calendar. If you decided to import the file into a new calendar, you may rename your newly created calendar by right clicking on the calendar name in Other calendars area and selecting Rename. The following steps describe how to import the Harvard Calendar .ics file to Microsoft Outlook 2013. 1. Obtain the appropriate Harvard holiday file and save it. Do not open the file or double-click on it. Opening it improperly will cause only the first event to appear. Please be sure to select Save only. Open the compressed file and place the Harvard Holiday .ics file on your desktop. 2. Open Outlook and click File -> Open & Export -> Import/Export. 2. Select Import an iCal (.ics) or vCalendar (.vcs) and click Next. 3. Browse to the your desktop and select the Harvard Calendar (.ics) file, select it, and click OK.
4. A dialog box will appear. Click the Import button to to actually import the data to your calendar. Your calendar file has now been imported into Outlook. Microsoft Outlook does not automatically include the official Harvard holiday calendar. This document includes instructions on how to add them using Outlook 2011. 1. Obtain the appropriate Harvard holiday file and save it. Do not open the file or double-click on it. Opening it improperly will cause only the first event to appear. Please be sure to select Save only. 2. Open the compressed file and place the Harvard Holiday .ics file on your desktop. 3. Open Outlook 2011 and open your calendar. 4. Drag the Harvard Holiday .ics file and simply drop it on top of your Exchange calendar in Outlook 2011. It may seem as though nothing happened, but a quick check on the nearest Harvard Holiday in 2015 should confirm they have been successfully added to your calendar. Microsoft Outlook does not automatically include the official Harvard holiday calendar. This document includes instructions on how to add them using Outlook 2010. 2. To decompress the file, please double click on the downloaded .zip file and move the .ics file to your desktop. Do not open the .ics file or double-click on it. Opening it improperly will cause only the first event to appear on your calendar. 3. Open Microsoft Outlook and display your calendar. 4. The new holiday events have now been added to your calendar. Verify calendar to make sure holidays imported successfully. Please contact the HUIT Support Desk at 617-495-7777 if you need assistance with this process.